As magical as a moondance. Gracefully arching callas are balanced by lush white hydrangea and exotic orchids in this gorgeous green and white arrangement. It makes a chic statement in a tall glass vase. 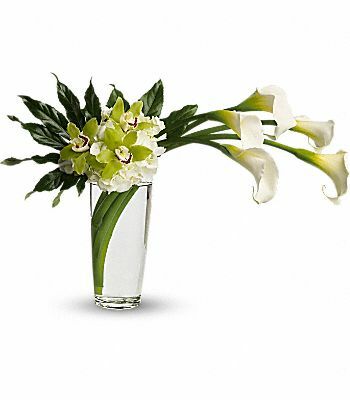 Five large calla lilies are arranged with white hydrangea, bright green cymbidium orchids and deep green aralia leaves in a tall pint vase.